Only 225.000.000 ULTI Coins are made, and no more will ever be created. • In pre-sale, there will be 118.125.000 tokens. • For ICO sale there will be 50.625.000 tokens. • To the company development 56.250.000 tokens. 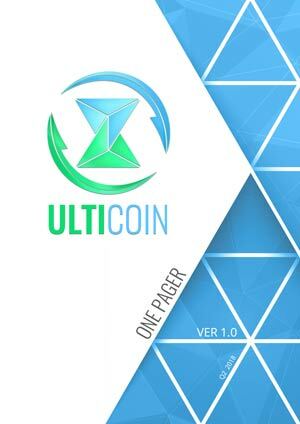 ULTI Coin pre-sale is divided into three phases. • 1st phase pre-sale - The first phase of pre-sale has 18.000.000 tokens offered, which is enough to finish the soft cap of initial coin offering. As a reward for our first investors in the first phase, we give a discount of 50 percent. • 2nd phase pre-sale - Once the first phase is finished, we are starting phase two. Phase two has 50.062.500 tokens offered. In this phase, the discount is 25 percent. • 3rd phase pre-sale - The last phase, phase three, has 50.062.500 tokens offered, same as phase two. In this phase discount is 12.5 percent. • 50% for development - The largest part of the investment will be allocated for the further developments and improvements of the platform and applications. • 5% legal - Bearing in mind the changes that are constantly taking place in the crypto world, the legal team will always be at our disposal for legally safe and legal in every sense. • 2% for unforeseen expenses - A small percentage of the funds are allocated for unplanned expenditures that we could not foresee in advance. Remain at your disposal for any additional clarifications you may need. We are obligated that if we do not make a soft cap ( 2.160.000 $ ), which is 8 percent of the whole token sale, we return investors their share. Pre-sale will last for three months, and the company keeps right to prolong sale time up to eight months under the circumstances of unforeseen technical issues.